Been craving for a decent bowl of ramen recently. Tampopo was pretty alright, though I can’t get past the amount of msg that is probably in the soup. 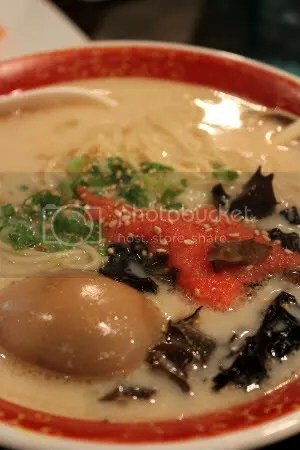 Ramen suggestions anyone?? 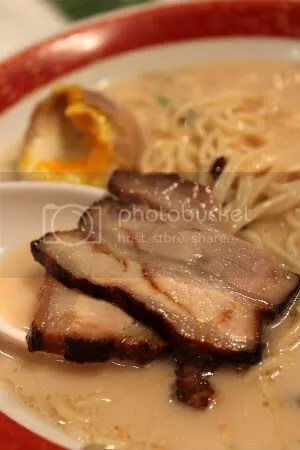 The good thing about tampopo is the range of ramen they have. 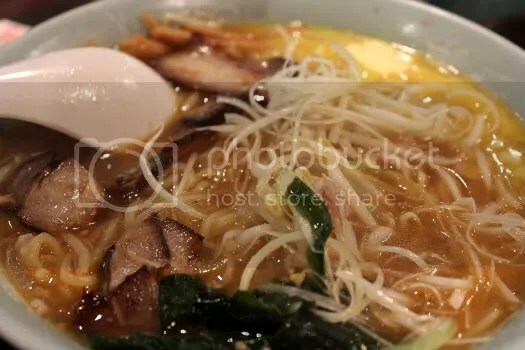 Instead of being restricted to a few choices, you have a wide range to choose from- spicy, pork broth, miso broth, hokkaido ramen, kyushu ramen etc. That of course can be a bad thing too, jack of all spades king of none? Both the parents opted for Hokkaido Ramen. Spy the melting butter in the background? It was in an adorable butterfly shape. I got the Kyushu Ramen. Loved all the different ingredients in the Ramen. 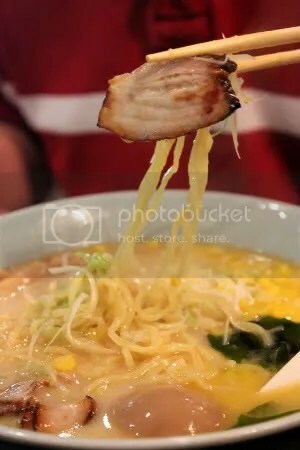 Kyushu ramen is thinner and heavier, not the springy Hokkaido type. I was hoping that it would have a crunchier texture but nope, it just tasted like regular noodles. That said, I really liked every ingredient that was included. Tampopo uses black pig meat. I can’t really tell the difference. It’s just well, just meat! I don’t usually take photos while I eat. Usually it’s one or two snaps and off goes the camera. But my oh my, this was a terrific hanjuku egg which deserved a shot! 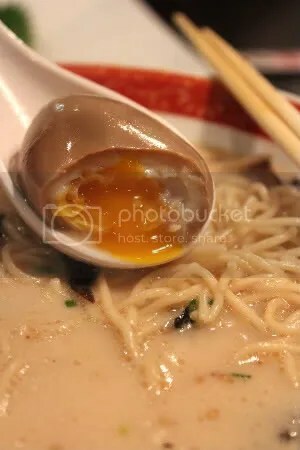 Beautifully browned by the soy sauce on the outisde, bite it and you are rewarded with the wobbly semi-cooked egg yolk within. 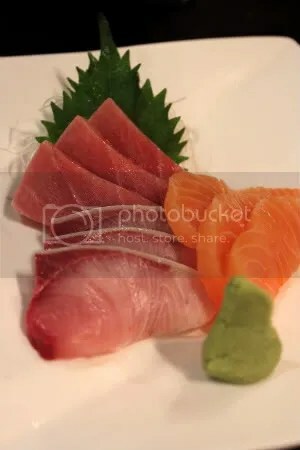 I don’t know if it’s because I’ve been deprived of sashimi for quite awhile, but the sashimi here (especially the salmon) tasted really delish. Won’t mind having a plate all to myself. Dessert #1: green tea parfait. 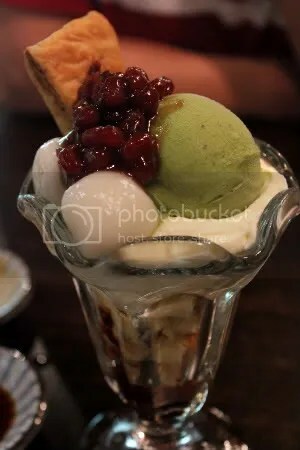 The green tea ice-cream was soft and intensely bitter complementing well with the sweet adzuki beans. The ingredients of the parfait provided a variety of textures of course, chewiness from the little mochi balls, crunch from the puff pastry and the delightful fluffiness of sponge cakes that tasted heavenly with the silky cream that tampopo is so famous for. Yes, this cream was whipped to just the right consistency- exactly the way I like it, silky not too airy with all the bubbles. Insisted on a double dessert because of the stressful week ahead ( yes, exams are coming and I am still blogging :O). 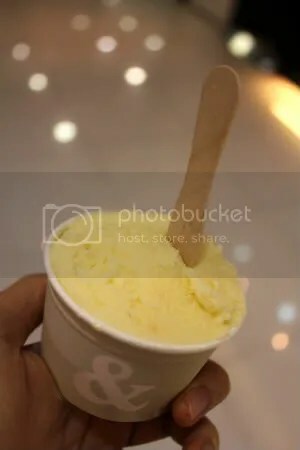 I prefer gelato on the whole because of the less creamy and more milky taste- slightly less heavy on the palate. The melon bits in my melon gelato were such a joy (: Densely packed into a tiny cup, I wished they were more generous!